You can do your ALM Octane work directly from the Eclipse Oxygen IDE packages, such as Neon and Mars. To do so, install the ALM Octane plugin for Eclipse. 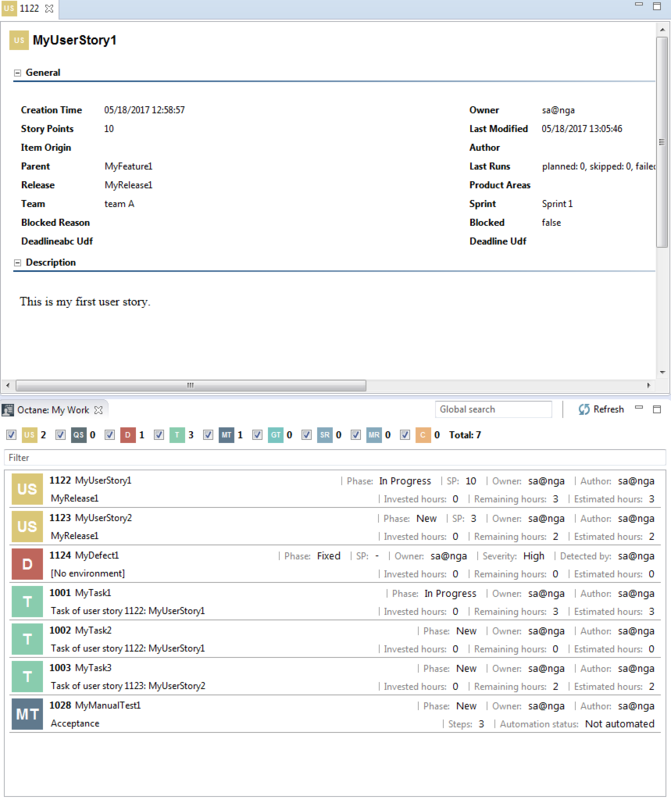 Using the plugin, developers can connect to an ALM Octane workspace, view ALM Octane items, and make updates. The plugins are open source. To access the source code, see https://github.com/MicroFocus/octane-eclipse-plugin. The plugin updates all data in the host Eclipse application. Changes made in Eclipse impact data in ALM Octane. There are three methods for downloading and installing the plugin. From within the Eclipse IDE, choose Help -> Eclipse Marketplace. In the Find box, search for the ALM Octane plugin. Follow the on-screen instructions to install it. From within the Eclipse IDE, choose Help -> Install New Software. Enter the URL for accessing the ALM Octane IDE plugin for Eclipse in Work with and click Add. Enter a name for the software in the Add Repository dialog box. Click Select All and Next twice. Accept the terms, and click Finish. Continue to Connect to ALM Octane. To install the plugin at remote locations without Internet access, download a compressed archive of the plugin onto a storage device. Unzip onto the storage device. For each remote computer, start the Eclipse IDE and choose Help->Install New Software. Enter the URL for accessing the ALM Octane IDE plugin for Eclipse in Work with. Accept the terms and click Finish. After installing, a new category of settings is available in Eclipse. We use this area to connect Eclipse to ALM Octane. In Eclipse, choose Window->Preferences-> ALM Octane Settings and continue to Connect to ALM Octane. Login using a browser. The ALM Octane login window displays and you can enter your credentials for logging into ALM Octane. Use this option in for both non-SSO and SSO, federated environments, and for session timeouts. Tip: In the login window, you can also click the Click here to use your system default browser link to open an authentication page for logging in. Enter your credentials, close the browser, and you will be logged into ALM Octane. Login with username and password. Enter your credentials for logging into ALM Octane directly. This option retains your credentials so you do not have to enter them each time. Tip: In Eclipse, if prompted, you can specify password hints for recovering your password. You can now work with ALM Octane from within Eclipse. This section describes how to do your ALM Octane from the ALM Octane's My Work tab. Choose Window > Show View > Other. Then expand Octane: My Work and select the connection. The My Work tab opens, displaying work assigned to you. Use the checkboxes in the My Work tab to filter which items you can see. When you start another session, the ALM Octane Eclipse plugin remembers what you were working on last time, and opens tabs in the ALM Octane pane accordingly. Most ALM Octane items are available from the IDE. You can see the comments in which you are mentioned. From a comment, you can navigate to the item that has the comment. To do this, double-click. Tip: To indicate that you are working on a particular item, and associate code changes with the item, right-click the item in the My Work pane, and choose Start work. A green triangle on the item icon indicates that you are "on it." When you are done, right-click and choose Stop work. Double-click any item to open its details in a separate pane. Click to choose which fields to see. You can also choose None or All. These settings only affect you. When you start another session, the ALM Octane Eclipse plugin remembers your field selection. View in Browser (System). This opens the item in a new browser window. View in Browser (Eclipse). This opens the item in a new pane in the current Eclipse IDE. To return to the regular Eclipse IDE view, right-click the item and choose Details View. You can search the list of items in the My Work pane and display the results in a new tab, the relevant items based on search criteria. Enter a search string in the search box. The search results are opened in a new pane. The plugin remembers the last five searches you ran. Click to select one and re-run the search. The search runs in the scope of the current Eclipse project only. Tip: The search looks through all ALM Octane items, not just the ones assigned to you. You can use the search to assign an item to yourself, or click Add to My Work from the context menu. As you implement stories and fix defects in Eclipse, update your ALM Octane items. Move the status of an item from one phase to another, according to the defined ALM Octane workflow. Limitation: You cannot edit the Feature field. If a rule exists that makes a field read-only, and you modify its value, the plugin notifies you when you save the item. Click Comments to view and add comments. Make sure to save . Gherkin tests can be initially created in ALM Octane, and then automated using Eclipse. In the My Work pane, right-click a Gherkin test, and choose Download Script. Select the folder into which you want to download the Gherkin test. Click OK. If the file already exists, you are prompted to overwrite it. Alternatively, you can cancel, and first rename the original script. You can declare to the SCM system, such as Git, that you have started work on an item in an Eclipse project. This means that when you commit changes for that item, automatically-generated text can be copied and pasted into the commit message for the item. You can commit changes for user stories, quality stories, defects, or active tasks. In the My Work pane, right-click a user story, a quality story, a defect, or an active task. Choose Start work. A "play button" appears on the icon for the item. Also, the item appears as a button in the toolbar in Eclipse. You can click this button to open the item's details in a tab. To generate the text for the commit message and copy it into the clipboard, right-click and select Commit Message to Clipboard. Alternatively, you can also click the corresponding button in the Eclipse toolbar. Tip: You must "start work" to copy the commit message. Commit your changes. In the Git Staging area, paste the contents of the clipboard into the Commit Message area. The format for the commit message contains the type and the item ID, followed by a colon (:). After the colon, enter more details for your commit message. For tasks, the item related to the task (such as a story or defect) is also included. To cancel the commit message, in the My Work pane, right-click the item and choose Stop work. Alternatively, click the Stop work button in the toolbar. You can also manually edit commit messages. For details, see Track changes committed to your Source Control Management system. Remove items from your My Work list if they are no longer relevant. Right-click the item and choose Dismiss. The items are removed from My Work, but are not deleted in ALM Octane.